When it comes to Christmas food, cookies rank high on the list of staples. All kinds of cookies. For us, they're synonymous with Christmas. I always try to make at least one cookie recipe I've never tried before. If you got some suggestions, I'm all ears. In order to help get us into the Christmas cookie spirit, here are links to my favorite holiday cookie recipes. How many of you have a family cookbook? It occurred to me this might be a good idea. Sure, I’ve got the recipes I like up on the blog, and a dozen or more cookbooks on my shelves, but there’s no central place the find all the recipes my family likes to eat. If we had a family cookbook, it would be easier for my wife and kids to make the things we like, without trying to hunt down the recipes in a dozen cookbooks or the internet. 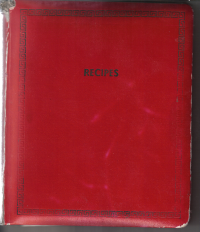 I also have a collection of the recipes used by three generations of home cooks: my mother, her mother, and her mother’s mother. A great treasure, I know. Right now they’re scattered between several index cards, old newspaper and magazine clippings. Wouldn’t it be great if they were included in the family cookbook, along with my own recipes, as well as the modifications I’ve made to some of their recipes? Can you imagine it? Four generations of home cook’s experience in one binder. It boggles my mind. Next, I got a large 3-ring binder and created divider cards for each category. 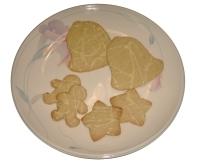 The next, ongoing, step is going through my blog archives and the recipes from my ancestors, entering them one at a time into my cookbook software. The software allows me to insert pictures, so I’ve been doing that where I could, as well. As I add them, I print them and put them in the notebook. To help get the rest of the family involved, I asked my oldest daughter, a growing talent in graphic arts, to design the cover. I’m both excited and daunted by the project. It’s a kind of “family food history,” a genealogy of familial food. When I finish it, I’m planning on making a gift of it to my siblings and other relatives. I hope they like it, but it's a long way off. How do you organize your family’s recipes? I’d be hard pressed to find a food my wife likes better than beef stew. It’s a winter staple for her. We have cans of the stuff hanging around the pantry all the time. I can’t stand the canned stuff. Most of it is crap. To make it palatable I’ve always got to mess with it or I won’t be able to keep it in my mouth long enough to chew and swallow. Making your own is much better, even if it can take all day to do it. Enter the slow cooker. I love using a slow cooker for cheap cuts of meat. It takes what can be a chewy mess and turns it into a tender and tasty indulgence. Low and slow is the answer, my friends. Low and slow. I’m not going to kid you, though. This recipe takes a bit more work than most slow cooker recipes. A bunch of stuff gets cooked a bit before putting it into the crock pot in order to get better caramelization and richer flavor. The results are worth the effort, though. Even my wife agrees. Now I just need to figure out what to do with all of these extra cans. Pull apart the roast along it’s major seams, using a knife as needed. Trim excess fat and silver skin. Cut into 1 1/2-inch chunks. Heat 2 teaspoons of oil in a large skillet over medium heat until smoking. Brown the beef in batches, about 5 minutes for each batch, and add to the slow cooker. Add more oil as needed. Reduce the heat to medium, adding 2 more teaspoons of oil until shimmering. Add the onions and a pinch of salt. Cook until softened, about 5 minutes. Stir in the garlic and cook for 15 seconds more, until fragrant. Stir in the wine and tomato paste, scraping up the browned bits from the bottom of the skillet. Simmer, uncovered, until the wine reduces by half, about 3 minutes. Pour into the slow cooker. Add the 3 1/2 cups of the broth, bay leaves, and thyme to the slow cooker. Stir in the potatoes and carrots. Cover and cook on low for 8 hours. Discard the bay leaf. Set the cooker to high. Whisk together the flour and remaining 1/2 cup broth until smooth. Stir into the cooker. Add the peas and parsley. Cover and continue to cook until the sauce is thickened, the flour is cooked, and the veggies are tender, about 30 minutes to an hour more. Season with salt and pepper to taste. You’d think that baking a potato once would be sufficient. It is, but why settle for sufficient when you can have glorious? Mashing that potato with cheese and then re-baking it in crispy potato shells turns sufficient into twice-baked potato elegance. To cut down on the cooking time in oven, we’re going to microwave the potatoes a bit, first. While this recipe uses cheddar cheese, gruyere, feta, or almost any other cheese can be substituted. Adjust and oven rack to the middle position and preheat to 450 degree Fahrenheit. Poke several holes into each potato with a skewer or fork. Microwave on high for about 8 minutes, or until slightly soft to the touch. Transfer the potatoes to the oven and cook directly on the middle oven rack until a skewer slide in easily, about 20 minutes. Remove the potatoes from the oven and let cool for about 10 minutes. Reduce the oven temperature to 350 degrees Fahrenheit. Slice the potatoes in half lengthwise. Using a spoon, scoop the flesh out of each half and transfer to a bowl, leaving a 1/4-inch thick shell. Arrange the shells upright on the baking sheet and return them to the oven. Bake about 10 minutes, or until slightly dry and crisp. While the shells are cooking, mash the potato flesh until smooth. Stir in the cheese, sour cream, buttermilk and scallions. Season with salt and pepper to taste. Remove the shells from the oven and increase the temperature to 500 degrees Fahrenheit. Carefully spoon the potato mixture into the shells. Return the stuffed potatoes to the oven and bake until spotty brown and crisp, about 15 minutes. Remove from the oven and allow to cool for 10 minutes before serving.